A close study of auroras has revealed new ways of understanding the physics of explosive energy releases in space, according to new UCL-led research. Auroras are an incredible light show caused by electrically charged particles in near-Earth space spiralling down Earth’s magnetic field and colliding with gases in the atmosphere, causing them to glow. They are also a tell-tale sign of physical processes in space, acting like TV screens by showing what happens millions of kilometres away from Earth where our planet’s magnetic field stretches into a long tail facing away from the Sun. For the study, published today in Nature Communications, the team from UCL and the University of Reading remotely observed rapidly evolving aurora to understand the physics behind why, when and how energy is released as the source of the aurora explosively reconfigures. “Somewhere in the huge volume of space into which Earth’s magnetosphere stretches, this energy release occurs via instability which is really hard to pinpoint. 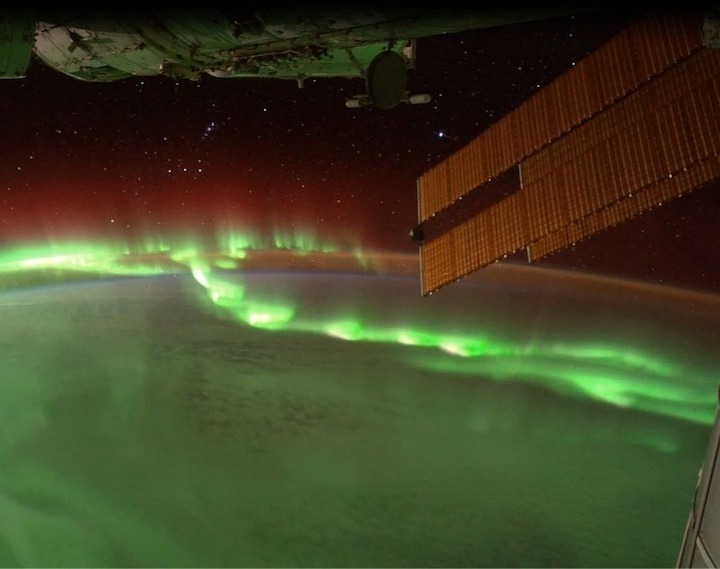 They cause substorms whereby charged particles surf into the Earth’s atmosphere on electromagnetic waves, releasing large amounts of energy and lighting up the aurora” explained study author Dr Jonathan Rae (UCL Space & Climate Physics). The team scanned a large portion of the sky and found the perfect substorm located over Poker Flats in Alaska on 18 September 2012. By using new data from the MOOSE (Multi-spectral Observatory Of Sensitive EM-CCDs) camera, they tracked the aurora as it moved towards the northern pole over a four minute period. This is a relatively long time for this type of aurora to be studied, allowing the scientists to collect a wealth of data. The information was then analysed for specific patterns that gave important physical clues to the aurora’s formation in space and time. The aurora began as a line of ‘auroral beads’ along an arc which grew exponentially in brightness and size. These growing ripples are a hallmark of an instability in space. By comparing these detailed characteristics from the aurora with state of the art theory, the team could narrow down the area of space where the instability most likely is. “We’ve shown that it’s possible to only study aurora to find out where instabilities are in space, which has not been done before,” explained co-author Dr Colin Forsyth (UCL Space & Climate Physics). Until now, scientists have been able to describe aurora and high energy events that occur on the Sun and other planets within the solar system, but this is the first time real physical analysis has been done. “Importantly, our work has given scientists more physics to work with. A whole range of theoretical models can be tested and refined based on the physical characteristics we’ve captured,” added co-author Dr Clare Watt (University of Reading). “What we’ve reported has eluded scientists since auroras were first described in the 1960s and while we use Earth as our closest laboratory, the findings will apply to other events elsewhere in the solar system. We now look forward to pinpointing this epicentre in space and finding out what makes it unstable,” concluded Dr Rae.